I would like to welcome everyone to the Necronomicon GateWalker’s Page. If this is your first time here, please read some of our previous articles located to the right of this page. Stay blessed! In our first discussion, we were able to identify Azathoth, or Azag-Thoth, with the Sumerian deity Nergal. We were also able to discover a close connection between Egypt and Sumeria. The amazing thing about all of this is that we were able to get a clearer historical understanding of the Cthulhu Mythos by use of the Simon Necronomicon. Since we covered the meaning of Azathoth in our first discussion and identified this deity as a multiplex of dthonic entities personified as the one god Nergal, it is important now to analyze Azathoth’s noted emissary Nyarlathotep. Although we discussed some attributes of Nyarlathotep in our prior article, it would now be good to look at some of Nyarlathotep’s characteristics described in the Cthulhu Mythos. This is a very iportant part of our discussion since the name Nyarlathotep does not appear in the Simon Necronomicom. How are we then to interpret Nyarlathotep in the Necronomicon Tradition? In H.P. Lovecraft’s story “Haunter Of The Dark,” we learn one of Nyarlathotep’s many manifestations, wherein he is described as the “three-lobed burning eye.” This particular manifestation is a huge bat-winged creature, with a burning tri-lobed eye. Other manifestations of Nyarlathotep according to Lovecraft fiction include, an Egyptian Pharoah, a faceless god in the caverns of earth’s center, the ‘Black Man’ of the witch-cult,” a black-skinned avatar of the Devil. “The Dark Waters trembled and roiled. It cannot be the real hill and church that I see in the pitch-darkness. out with their candles if the lightning stops! mad or going mad – the thing is stirring and fumbling in the tower. This is a very interesting point. Osiris is a Greek term. This also applies to the name Egypt as well. The indigenous people called their land Khem and the god Osiris was not known by this Greek label, but by the name Asar. One can easily see the similarities between the terms Asaru and Asar. 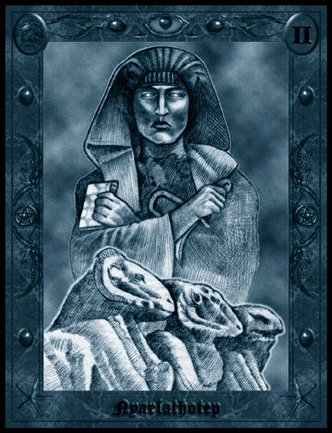 The reader can easily search and discover many discussions amongst scholars that show a connection between Asaru and Osiris. This being the case, we find even greater parallels in the works of H.P. Lovecraft and the Simon Necronomicon. In the earlier part of our discussion, we were able to identify Nyarlathotep’s manifestation as a faceless god in the caverns of earth center with the Dog-faced Anunnaki of Simon Necronomicon fame, and from here we were able to relate this to the Chaldean Oracles of Zoroaster. However, this manifestation of Nyarlathotep has even a deeper meaning. From the information quoted above, it is possible for Jinn and humans to parent offspring together and this evidently happened at one time. Further details about this phenomena is covered entirely in the Atlantean Necronomicon. However, for our discussion we learn that the jinn were created before mankind by several thousands of years, were responsible for the construction of the Three Great Pyramids, and are made of fire. this all resembles Nyarlathotep’s manifestation as the “three-lobed burning eye,” described in the Simon Necronomicon as Asaru- The Eye Upon the Throne, which all equates to Osiris. When we divide 1,001 Moons by 13 Moons in a solar year, we get the sum of 77, or 7 + 7, which equals 14. This shows us that the Simon Necronomicon and the Necronomicon Tradition is not only inspired of Chaldean and Sumerian sources, but also Egyptian and Asian. this is consistent with Lovecraft fiction as well. In conclusion we can get a greater appreciation for Nyarlathotep by defining his name. Wow, Brother! This is an awesome article! Having studied into the Egyptian mysteries a bit in the past, this article inspired quite a few remembrances & new connections. I worked primarily with Anubis back then & now I feel I understand why. Thanks again for another inspiring article!